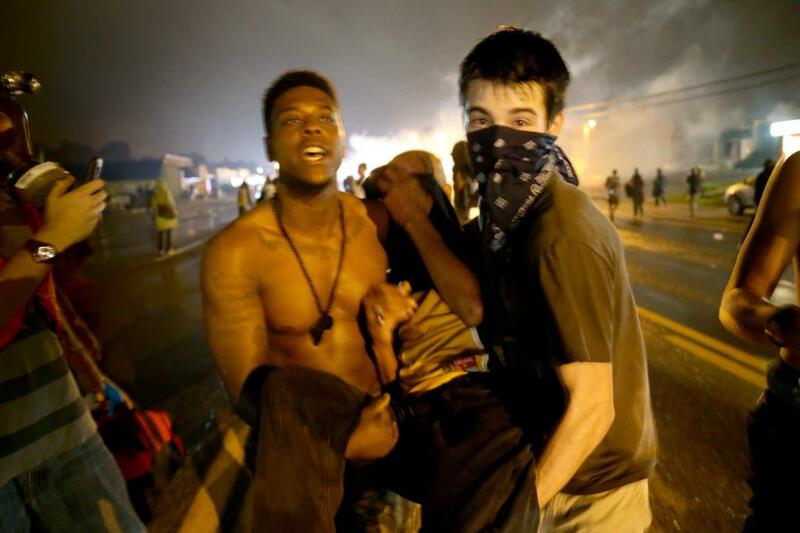 On August 19, ten days after police murdered Michael Brown in Ferguson, Missouri, a slew of corporate media stories appeared charging that “criminals” and “outside agitators” were responsible for clashes during the protests. CNN alleged that “all sides agree there are a select number of people—distinct from the majority of protesters—who are fomenting violence,” quoting a State Highway Patrol Captain, a State Senator, and a former FBI assistant director to confirm this. So when we hear them say “outside agitators,” we know the authorities are getting ready to spill blood. All the better, from their perspective, if people buy into this rhetoric and police themselves so no officer has to get his hands dirty. This is often called for in the name of avoiding violence, but self-policing returns us to the same passivity that enables police violence to occur in the first place. How many people would have even heard about Michael Brown if not for the “criminals” and “agitators” who brought his death to our attention? Self-policing also preserves the impression that we all choose this state of affairs of our own free will, reinforcing the impression that anyone who does not is an outsider. Still, let’s imagine that some of these arrestees who gave out-of-town addresses are in Ferguson for the very first time. Wouldn’t that make them outside agitators? Perhaps it would, if the issue was specific to Ferguson alone and they had no stake in it. But in “Chicago, Brooklyn, Washington, San Francisco, Austin, Des Moines, and Huntsville, Alabama” the police have killed black men under identical circumstances. The militarization, brutality, and systematic racism of the police are in effect all around the country, not just in Ferguson. When people are suffering the same forms of oppression everywhere, it makes sense for us to come to each other’s assistance, to make common cause. In this light, it is ironic, if not unexpected, that one of the corporate media stereotypes of the “outside agitator” is the “white anarchist”—as if all anarchists were white. It’s no longer considered decorous to call people race traitors, so the allegation is inverted: white people who fight alongside black and brown people must not have their best interests at heart, certainly not as much as the police and corporate media do. Although declaring oneself an anarchist does not magically free a white person of the racism that pervades our society, it is racist indeed to attribute all the unrest in Ferguson to “white anarchists,” denying the existence or agency of black and brown participants.